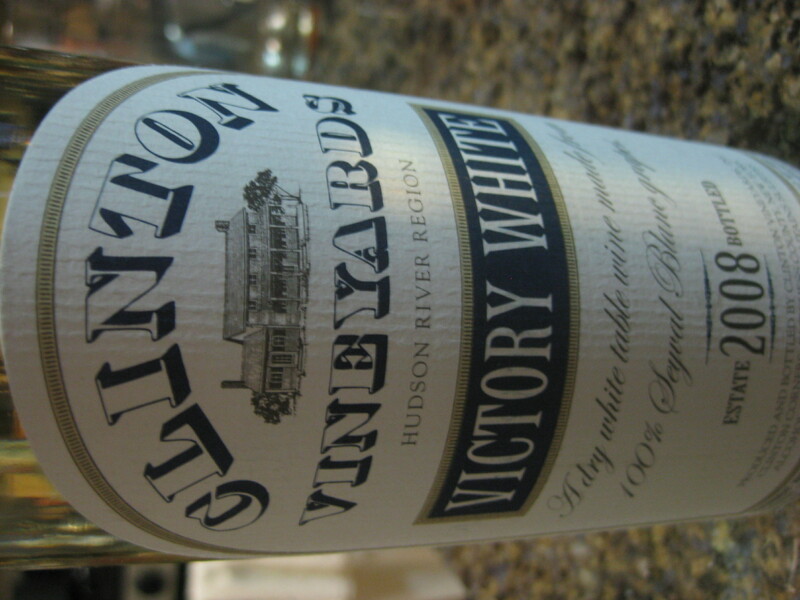 Politics pairs with wine about as well as mustard does. Best to keep it in the kitchen and add in little bits before the meal, never during the meal. A rare exception to the mustard rule though is found in the wine shown above. All Seyval Blanc, a prolific grape throughout the United States and Canada, one blog terms this the “Rodney Dangerfield” of wines, so you’re forgiven for not recognizing the grape name. It’s a blend of American grapes and European grapes, meaning neither continent really gives it much R-E-S-P-E-C-T.
Thankfully though, somebody in the Blue Map part of the country decided to devote their vintage to the victory of Barack Obama and make this disrespected Seyval Blanc grape into something quite respectable. 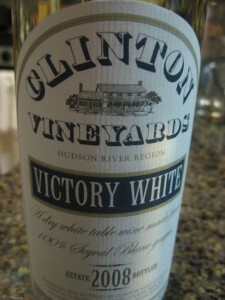 Not that the Victory Wine was without precedent – Clinton Victory 1992 and Clinton Victory 1996 also resulted in Victory Wines. Apparently, Bush Victory 2000 and Bush Victory 2004 didn’t sell well in New York. Seyval Blanc, even without the NY brand of “I <3 Dems" politics, manages to grow pretty ubiquitously in this New World of ours, although probably more east of the Mississippi. 40 states apparently grow this unknown, un-respected grape, and still nobody’s heard of it. Wine growers do love its cold-weather hardiness, and it’s quite possible Seyval Blanc ice skates in the off-season with Vidal Blanc and Gretzsky. Smells acidic so you’re thinking “mussels wine,” but tastes almost sweet and much much thinner than expected. Thinner not in an anorexic way but more in a healthy, girl-next-door way. Wine coats the mouth but doesn’t cling (think vee-OHN-yay, not chardon-NAY) – it just makes its mark and moves on. white flowers, peach and some fresh cut grass all come to mind, which is to say, the wine has a lot and i’m not entirely sure about everything that shows up but pretty confident peach is in the mix. * England, much in the news as of late for its bubbly, grows loads of Seyval Blanc. * Blue cheese on a hamburger – take it from a chef and pair your Seyval Blanc up right. * Home winemakers in North America seem to love this grape if their posting quantity is any indication. Maybe the commercials should take note.